An effective air conditioner is important to the comfort of a home environment. Nothing is worse than a broken air conditioner in the middle of July! Even in moderate weather, air conditioners are still needed. They don’t just control temperature. They control humidity, air movement, and air filtration of the indoor climate as well. If your air conditioning system needs maintenance or repairs, B&L Ott is here for you. 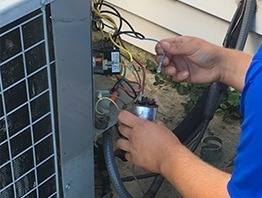 We offer quality and affordable air conditioner repair services throughout Berks County. The mechanics of an air conditioning system can be complicated. A refrigerant evaporation cycle must occur. This starts with a compressor that cools refrigerant. It turns the refrigerant into hot, high-pressure gas. The gas travels through coils to dissolve its heat and condense into a liquid. The liquid then expands into a valve and evaporates to become cold low-pressure gas. Finally, the cold gas travels through coils and cools down the air in the home. With so many different parts interacting, it can be difficult to figure out where the problem is. It can be even more difficult to figure out how to fix the problem yourself. Let the professionals at B&L Ott help. If you notice any of the issues listed below, contact B&L Ott for maintenance and repairs. The air is not as cold or inconsistent. The air flow in your home has weakened. Your energy bills have been rising. You have had problems with your thermostat. You hear strange sounds or smell weird smells. If left untreated, small issues can turn into big problems. It is important to make repairs soon after you notice them. It is also important to make sure the job gets done right. B&L Ott has professional and knowledgeable technicians that give attention to details. We thoroughly test and inspect your air conditioner to make sure you have cool air when you need it most. There is a lot that can go wrong during this complex process. That’s why we are here to fix the problem and make your home climate a better place to live in. If you need to get your air conditioning back in working order, please contact B&L Ott with any questions or to request service. Fill out the form below and we’ll get in contact with you, answering your questions and/or scheduling a repair time.